Paths can be created by the Mano Libera, Bezier, and Pennino drawing tools. They can also be created by conversion from a regular shape or text object. The Freehand (or pencil) Tool is perhaps the easiest tool with which to draw a path. Simply click on the icon (F6 or p) in the Casella degli Strumenti and then click-drag the mouse over the canvas to draw a line. Holding down the Shift key while drawing temporary disables nodes snapping to the Griglia or Linee Guida. As long as a path is selected, you can extend the path by click-dragging from one of the path's ends. To prevent adding to a path, deselect the path with the Esc key. To delete an unfinished path, use Esc or Ctrl+Z. Paths drawn with the Strumento Mano Libera tend to be composed of many Bezier curves leading to an erratic-looking path. One can smooth and simplify such curves by using the Tracciato → Semplifica (Ctrl+L) command one or more times. A path drawn with the Strumento Mano Libera after zero, one, and multiple applications of the Path Simplify command (with nodes shown). There are two possible modes for this command. The default is to treat all of the selected paths as one object. The second mode is to treat each sub-path separately. To use the second mode, add an entry in the «options» section with «simplifyindividualpaths» set to '1' in the file .inkscape/preferences.xml. Single dots can be created by using Ctrl+Left Mouse Click. The size of the dot can be set in the Pencil section of the Preferenze di Inkscape dialog as a multiple of the current Contorno width. The dot is represented in SVG as a filled path. Adding the Shift key doubles the dot size while adding the Alt creates a random size dot. The Strumento Bezier has the same options. As mentioned previously, all paths are represented in Inkscape as a series of Bezier curves. 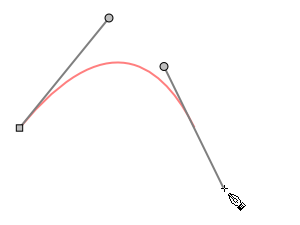 The Bezier (or pen) Tool allows you more directly control the Bezier parameters as you draw a path. To select the tool, click on the icon (Shift+F6 or b) in the Casella degli Strumenti. This is one place where paying attention to the Area di Notifica is especially useful. The region not only lists your options at each step but also gives the distance and angle the cursor is from the last node when placing a new node or dragging a handle. 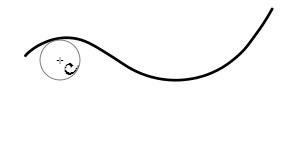 To begin to draw a curve, click-drag on the canvas. The point where you click becomes the end point or node of the curve. As you drag the cursor, you'll see a gray line between the end point and the cursor. This line is a tangent to your curve at the end point. Release the mouse button to establish the first control point. Start of drawing Bezier curve. Move the cursor to the position of the next Bezier curve end point or node. A red line will show you the shape of the curve. Positioning of next Bezier curve end point (node). Click-drag from the end point to draw out a handle that allows you to set the second control point. The pointer is actually pointing to the sister of the second control point, which is the initial control point of a second Bezier curve to be attached to the first. 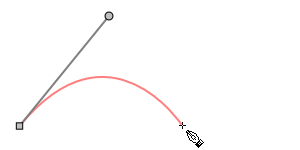 The two points are collinear with and the same distance from the Bezier curve end point or node. Setting of second Bezier curve control point. Next, move the cursor to the end point of the second Bezier curve. 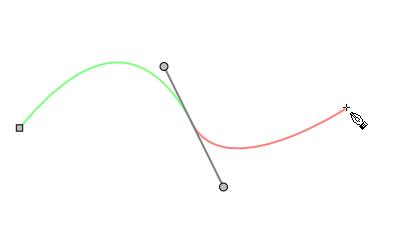 Positioning of end point (node) of second Bezier curve. One can repeat the above steps to add as many Bezier curves to the path as required. To end the path, press Enter or do a Right Mouse Click after placing the last Bezier curve end point. The finished path, composed of two Bezier curves. To create a path of straight lines, click rather than click-drag at each node. You can use the Arrow keys to move the last node created while drawing a path. Shift+Arrow moves the node by ten times the normal step, Alt+Arrow will move the node by a screen pixel. To set the two control points of a node separately (and force the node to be a corner point), first set the control point for the end point of the previous Bezier curve, then hold down the Shift key while setting the control point for the next Bezier curve. To constrain a node to be at a multiple of the Scatto di angolo di rotazione with respect to the previous node, hold down the Ctrl key while setting it. To delete the last node drawn, use the Backspace key or the Del key. 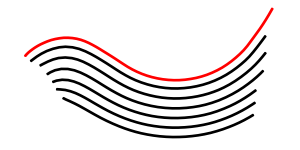 To change an unfinished segment (the red line) from a curve to a line, use Shift+L. To change an unfinished segment from a line to a curve, use Shift+U. To extend a previously drawn path, select the path, then click or click-drag on an end point. To close a path, click on the first endpoint when placing the last endpoint. Single dots can be created by using Ctrl+Left Mouse Click. The size of the dot can be set in the Pen section of the Preferenze di Inkscape dialog as a multiple of the current Contorno width. The dot is represented in SVG as a filled path. Adding the Shift key doubles the dot size while adding the Alt creates a random size dot. The Strumento Mano Libera has the same options. As the name suggests, the Strumento Pennino can be used to draw calligraphic lines. The resulting paths are a bit different than those drawn with the Mano Libera and Bezier tools in that they are composed of two parallel (or almost parallel) sub-paths, allowing the resulting line to have a variable width. The path is not stroked but the Riempimento is solid (see Capitolo 10, Attributes). A path drawn with the Strumento Pennino. The bottom path shows how the nodes are placed. To begin drawing a Calligraphy path, select the tool by clicking on the icon (Ctrl+F6 or c) in the Tool Box and then click-drag the mouse over the canvas to draw a line. The line will have by default the Stile corrente. You can choose to draw all lines with a fixed style by selecting the This tool's own style option under the Calligraphy section in the Preferenze di Inkscape dialog. If you turn off the Keep selected option in the dialog, a newly drawn object will not remain selected; you can then choose a color from the Palette for the next calligraphic stroke without changing the color of the previously drawn stroke. The Calligraphy Tutorial (Aiuto → Lezioni → Inkscape: Pennino) has many ideas on how to use the Calligraphy Tool. The Strumento Pennino has many options, two accessible from the keyboard and the rest from the Controlli Strumento. It is best just to try changing the various option settings to get the feel for them. To change the pen width while drawing: Left Arrow and Right Arrow. New in v0.46: The Home key sets the width to the minimum while the End key sets the width to the maximum. Typing Alt+X will enable the Width entry box in the Controlli Strumento; enter a number and then hit Enter to set an exact width while drawing. To change the pen angle while drawing: Up Arrow and Down Arrow. To add to an existing path (form a union), hold the Shift down while drawing. The Controlli Strumento contains too many options to all be shown at the default Inkscape window width. 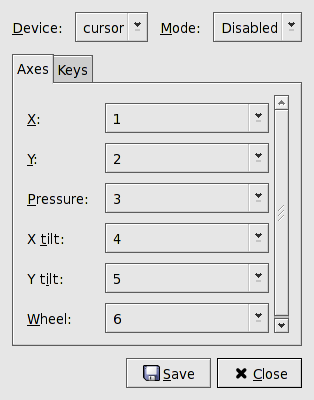 To access all the options, widen the Inkscape window or click on the triangle at the right of the bar, which will show a drop-down menu with the missing options. The Calligraphy Tool Controls — expansion. To see these options, widen the Inkscape window. Pen width (1 to 100): number is tenths of percent of canvas width (i.e., 15 is 1.5% of canvas width). Note that if you change the zoom level, the effective pen width will change. To keep the pen width constant, check the Width is in absolute units box under the Tools-Calligraphy page in the Preferenze di Inkscape dialog. The pen width will then be in units of px. : On/Off button: Use tablet pressure for width (requires tablet input device). : Trace background: Vary the width of the pen as a function of the background. A dark background yields a wider pen. > 0.0: Line width decreases with speed. = 0.0: Line width independent of speed. < 0.0: Line width increases with speed. 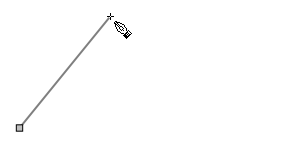 Angle (-90 to 90 degrees): Angle of pen relative to horizontal axis. : On/Off button: Use tablet tilt for pen orientation (requires tablet input device). Fixation (0.0 to 1.0): How the angle of the pen follows the direction of the pen. 0.0: Angle follows pen direction (always perpendicular to motion). 1.0: Angle fixed to angle defined in Angle entry. Caps (0.0 to 5.0): How round is the end of the stroke. This can be used to produce round end-caps when the fixation is small (i.e., simulating a round brush). Note that the cap extends beyond where the stroke would normally end. 5.0: Elliptical, approximately five times longer than wide. Tremor (0.0 to 1.0): How much random shake should the stroke have. This parameter can be used to create a more realistic looking calligraphic stroke by adding some randomness to the thickness of the stroke. It works by adding randomness to the node handle orientations. Renamed from Drag (with the numerical values inverted) in v0.45. Wiggle (0.0 to 1.0): How resistant the pen is to movement. With a value of 1.0, the pen will wiggle all over the paper. Mass (0.0 to 1.0): How the line follows pen movement. The more massive the pen, the smoother the stroke but the less responsive the pen will be. Try a value of 0.10 for a good compromise between smoothness and responsiveness. Two options require the use a tablet (e.g., Wacom): using tablet pressure to control the width of a stroke and using tablet tilt to control the orientation of the pen's nib. This is discussed in the next section. Inkscape can make good use of a tablet for input. This is especially true with the Strumento Pennino where stroke width and nib orientation can be controlled directly with a pen. Before using a tablet, the extended input devices must be configured and enabled with the Dispositivi di Input dialog (File → Dispositivi di Input... ). This dialog is the same as used by Gimp; however, not all features may work the same. Ignore: Don't enable special features of extended input device. Treat as a regular mouse. Screen: Extended device will work as regular mouse outside of Canvas region. Window: Extended device works only in Canvas region. The Keys tab allows you to assign key combinations to the macro keys, if any, on the tablet. Pressure and tilt do not work properly on OS X due to problems with the X11 implementation. An example of calligraphy using a Wacom tablet. The figures are the numbers 1 through 10 written (poorly) in the characters common to Chinese, Japanese, and Korean. The tablet pressure was used to control the stroke width. A stroke made using a Wacom tablet with pressure sensitivity may create a mess at the beginning of the stroke or where there is a quick change in direction. This is especially true when the Fixation is set to a small number. Below is an example of this. By removing some of the nodes, the stroke can be cleaned up. The significance of this problem has been dramatically reduced as of v0.45. An example of cleaning up a calligraphic stroke. Top: Original stroke. Middle: Original stroke showing path and nodes. Bottom: Cleaned-up stroke after removing several nodes and adjusting some handles. The Strumento Pennino has an option that allows parallel lines (hatchings), as found in engravings, to be easily drawn. To use this option, first select a guide path. Any path, Forma or text can be used as a guide. Then with the Ctrl key held down, drag the pointer along a line parallel to the guide path. The closest distance between the start of the drag and the guide path determines the distance the new line will be away from the guide. This is indicated by the gray circle around the pointer. As you begin to drag, the circle turns green. This indicates that the cursor is tracking the guide. When you finish drawing a line, don't release the Ctrl! Just start drawing (Left Mouse Drag) another line. As long as you hold the Ctrl key down, each new line will use the last drawn line as a guide and the spacing will remain the same. If you deviate too far from the guide, the pointer will break free. This is indicated by a red circle. This is an intentional design decision to allow one to continue a line past the end of the guide. If you accidently break free, you can delete the last path and start again; but you must reset the interline spacing. A slow steady hand works best. If the cursor is consistently closer or farther away from the guide path than the set spacing, the interline spacing will gradually decrease or increase. This is a subtle effect. The Strumento Pennino cursor near a guide path when the Ctrl key is held down. A series of «engraved» lines created with the Strumento Pennino while holding down the Ctrl key. The red line is the guide path. The Trace Background ( ) option can be used to generate hatchings with pen width reflecting the background darkness as shown below. A tracing of the shadow on the left is shown on the right. The Strumento Ritocco was used to clean up the ends. By default, each new line uses the previous line as its guide path. To use the original guide path for each line, turn off the option Select new path found under the Strumento Pennino section in the Preferenze di Inkscape dialog. The author finds it easier to make hatchings with this option turned off. Use Touch selection to select the lines in the hatchings. It is often easier to keep hatchings in a separate Livello. There are several ways to generate paths indirectly. One is to convert a regular shape or text object into a path. Another is to use Stroke to Path, which converts a path into a closed path with two parallel sub-paths. 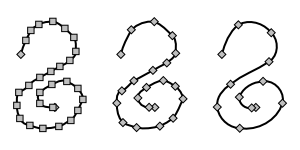 A third way to generate a path is to trace a bitmap image. This method is considered in Capitolo 17, Tracing Bitmaps. To convert a regular shape or text object to a path, use Tracciato → Da Oggetto a Tracciato (Shift+Ctrl+C). Once an object is converted, the object loses any special knowledge associated with its previous existence. For example, the text font cannot be changed. But once an object is converted to a path, it can be modified in any arbitrary way, as shown in la sezione chiamata «Un Logo dell'Hiking Club - Un Esercizio sui Tracciati». A stroked path can be converted to a filled object consisting of two parallel sub-paths using Tracciato → Da Linea a Tracciato (Ctrl+Alt+C). The path should have a non-zero thickness. The before and after objects look the same but have different structure and behavior. See the difference in the nodes in the figures below. A stroked path consisting of three nodes. A filled path made from the stroked path by using the Stroke to Path command. It consists of ten nodes. The Stroke to Path command can be used to make a sets of parallel lines. Simply draw the path you desire, setting the width to the desired gap plus the desired final stroke width. Convert the stroke to path, remove the fill, and add the stroke paint. The line segments at the ends can be removed if desired by selecting each pair of end nodes and using the Split path between two non-end nodes command in the Strumento Nodo-Controlli Strumento (see next section). 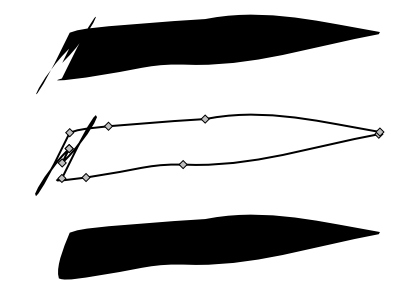 The Path Offset commands (for closed paths) or Complex Strokes are alternative ways of creating parallel lines. Creating parallel lines. 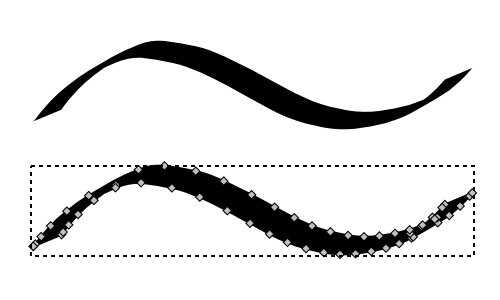 From left to right: Single line, Filled path after Stroke to Path command, Fill removed - Stroke painted, Paths at ends removed. 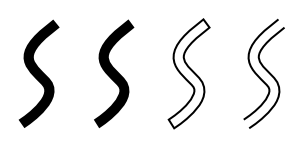 The Stroke to Path command can also be used to make polygons with uniformly rounded corners, as shown below. The trick is to use a wide Contorno and set the Unione style to Round. From left to right: A simple triangle; the triangle with a wide Contorno (the opacità of the Contorno has been set to 50% to allow the triangle shape to be seen); the finished triangle with rounded corners after using the Stroke to Path command and after removing the inner triangle.